Year 0 isn't really an official year. It's all the years leading up to formal schooling, so for my 5 year old (and to some extent my 3 year old), it means working on habits, exposing them to good books, simple handicrafts, letting them tag along for the riches, and enjoying nature study. Eleanor is a precocious child, and she enjoys doing. Worksheets, crafts, nature journals, learning to read. It doesn't matter - she will ask for something and puts forth a lot of effort and really enjoys what she does! Eloise is our wild child. She didn't really do anything formal this year, but she did tag along on nature study of course, some art/handicrafts, and she enjoys books. She chose Panda, Panda Bear, What Do You See? as her favorite. She also really likes The Runaway Bunny by Margaret Wise Brown. I was going to do Before Five in a Row with the girls, but that just didn't happen. We did a couple of rows, and they were fun enough - but when I switched the boys to Ambleside Online, it was so easy to switch the girls to Year 0. AO Year 0 is more in line with my natural tendencies, and the 5 year old already liked listening to their readings. Eleanor enjoyed Emory's Burgess Animal Book for awhile (and Birds, when we read that together) and even listened in to other readings. I know she was making connections with Age of Fable from Year 4, because when our co-op's drama club did a skit based on a greek myth, she recognized it! So here is a peek at our year, not necessarily in chronological order . . .
Eloise is a bit more in the thick of things. She catches bugs in a bug catcher, and probably going to be a bit more adventurous like Emory. Whereas Eleanor adored starting her own nature journal. This was an American Toad, based off a picture I took of one splayed out in the water. She doesn't mind getting dirty though, especially if it means helping pawpaw, because then she will do anything for her favorite person! We do lots of blocks, puzzle play, and pattern blocks, and other hands-on activities. It's an easy way to engage the girls while the boys are working. Eleanor was Mary for the Christmas program. This was Eleanor's red-winged blackbird from listening to The Burgess Bird Book with her brother. In addition to drawing, Eleanor loves any kind of handicraft type activity. She's very artsy crafty, so I'm always looking for easier activities to introduce to her. Super Beads - an fun beginner handicraft that she adored! Trying her hand at origami for the first time! Decorating her first pinch pot! A sticker-by-number unicorn craft that she bought at the AWANA store. Play-doh is a great beginner activity to build fine motor skills and prepare for other handicrafts. These are a sampling of the type of quality picture books we read this year. Of course, she joined in on the family free reads, which I'll share later. The girls had a good Year 0. So many lovely stories, so much fun outdoors, and creativity and imagination running wild! An AO Year 0 allows littles to be little. I look forward to another rewarding year of this! Eleanor will technically be K and transitioning to formal lessons since she turns six, but Eloise is only three, and we still have a few years left of this informal, but beautiful way of exploring and learning! 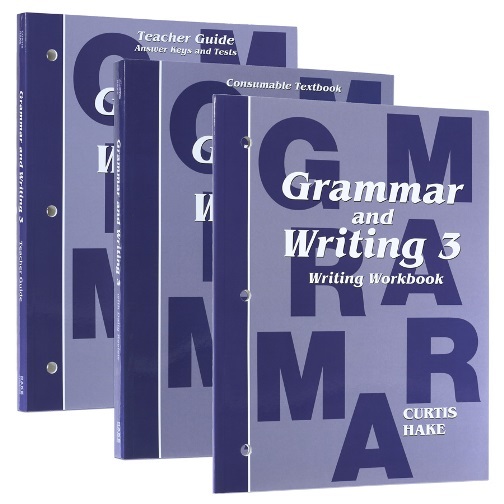 I typically start light grammar instruction around 3rd or 4th grade, so when I was offered the chance to review the new Hake/Saxon Grammar and Writing 3 from Hake Publishing, I was certainly interested. I used this with Emory, who was wrapping up the 3rd grade when this arrived. He has had little grammar instruction, so we were basically starting fresh. The Grammar and Writing 3 program is designed after the popular Saxon Math, which is very familiar in the homeschool world, and is the newest addition to the lineup that already includes fourth-eighth grade grammar. It includes three major components: Student Textbook, Writing Workbook and the Teacher Guide. Teacher Guide - The Teacher Guide includes an overview and instructions to the teacher for how to use the program. Every lesson has a scripted meeting, which includes Speaking & Listening and Vocabulary. The student can read along in their book. Then the lessons instruct you to begin the actual Grammar Lesson from the Student Textbook, followed by the Review. Suggested time to complete each activity is included. The Teacher Guide also includes the tests and more practice sheets, as well as an answer key for the textbook, tests and practice pages. A suggested schedule is included as well. The first 10 lessons are completed before the first test and writing lesson, and then they occur after every five lessons. Some writing lessons are extended for two days. The schedule includes 146 days of instruction and testing, so if the lessons are completed as scheduled, there is room in a typical 180 day schedule, or it allows some wiggle room for those on a 4-day week schedule. The only minor issue I can foresee with this schedule and pacing is that they suggest 40-45 minutes for completing every lesson, and they insist that every single exercise in every lesson be completed to benefit from the incremental design of the program. The idea for the longer lessons is to omit homework, but as a homeschool family, homework isn't an option anyway. So it has to be done in one day, or broken over two days anyway. We are Charlotte Mason homeschoolers, and find that her insistence on shorter lessons really is beneficial. Short, varied lessons are far more efficient for us. At this time, Emory completes the lessons in about 20 minutes, so it's not a real issue, but should it ever arise, I would just break the lesson into two shorter sessions during the day. It would be easy to do the main lesson, and do ether Review Set later in the day. Otherwise, frequently spreading a lesson over two days would extend the program and be difficult to finish in one year, if that's important to you. Student Textbook - The student textbook contains the lessons and exercises. Everything is laid out in clear print, black and white, with no pictures, though some pages are very full so it can sometimes still look busy. The instructions are easy to understand and Emory does well with the workbook and exercises, without much input from me. Concepts are introduced quickly, but he seems to catch on quickly with the frequent review. Writing Workbook - This element contains direct writing assignments. The writing lessons are scheduled to be completed on test days, or sometimes over two days. 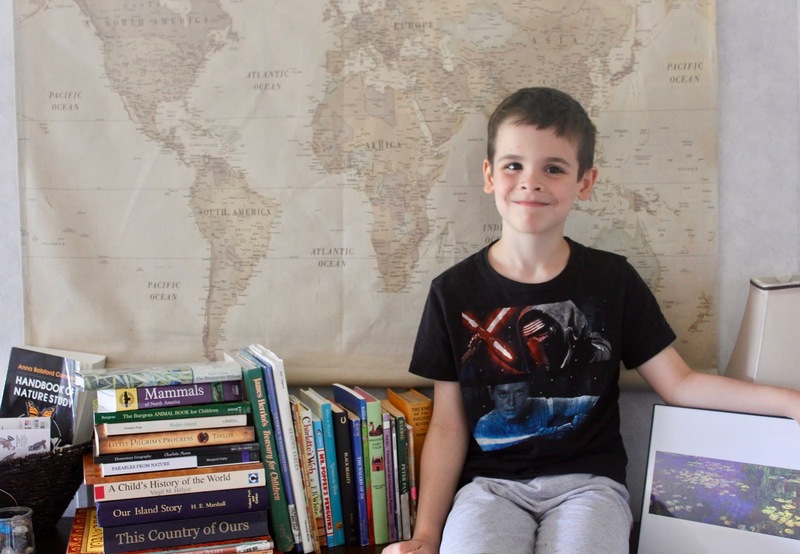 The introduction encourages the student to create a notebook for collecting ideas, memories, questions, and drawings, to use as inspiration for future writing. There are also instructions to keep a three-ring binder for their daily journals and the writing assignments. These pages are perforated and hole punched already, making it easy to slide them into their personal binder. Since the writing lessons are scheduled with the tests, the assignments often reinforce the corresponding grammar lessons. When using the complete program, you'll find the grammar book includes instruction on the sentence, verbs, nouns, vowels and consonants, spelling rules, capitalization, prepositions, sentence diagramming, adjectives, dictionary information, punctuation, and much more. The writing program starts simply, with the sentence, then works up to the paragraph. Finally, it teaches different types of writing - persuasive, expository, narrative, descriptive and the chapter summary. It also works through brainstorming, fact and opinion, and evaluating your writing. This program doesn't cover reading/literature, spelling or penmanship, but when used as written, this is a complete grammar and writing course. 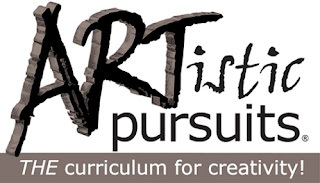 The website claims that this is a rigorous curriculum, and I can see why they make this claim. 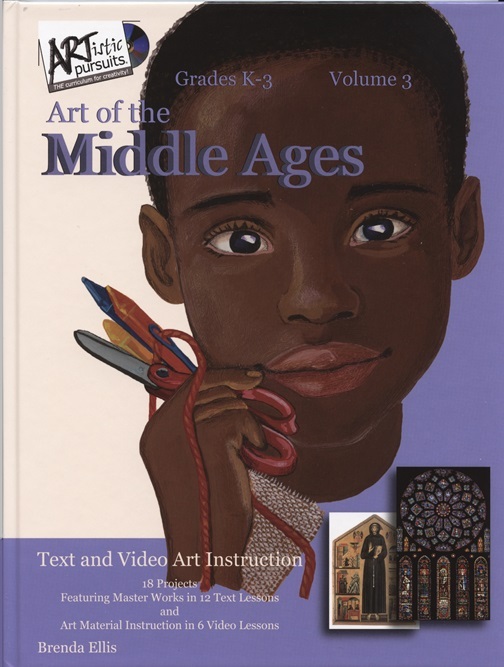 The topics are introduced quickly, and it's a lot of material to cover for just third grade. The other grade levels all cover the same content, just at different reading levels and depth of instruction, and they recommend a minimum of two years of grammar. I am inclined to think that a mid or upper elementary level, and one middle school level should be sufficient. Overall, I feel it's a thorough grammar curriculum laid out in a traditional format, but since it's a quick and easy lesson, he doesn't mind it. We received it late in the school year, and we're very ready for summer break, so we'll just pick this back up next year to finish. More crew members are reviewing this level, so be sure to check out the other reviews for more perspectives! I recently shared (AO Y2 in review) that we have officially ended the 2017-2018 school year, though we're still working on a few things here and there to wrap up some loose ends. 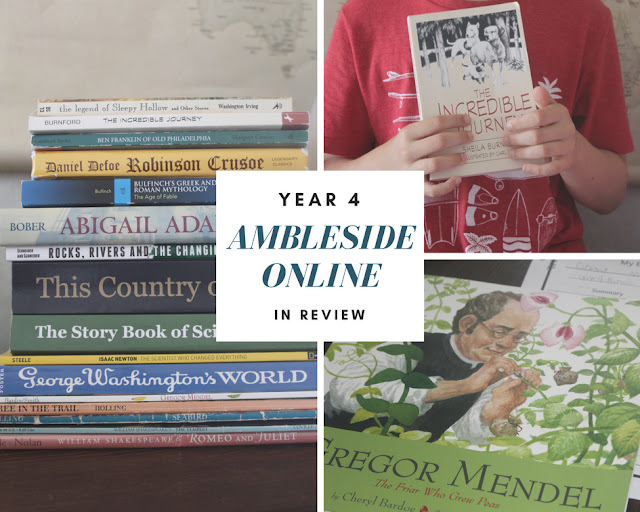 When we looked back over the year, I was very happy with our transition to Ambleside. Just as I did with his brother, I asked Elliott to look over everything and think about his favorites from the year. Even if they don't see the feast in the same way I do, I want them mulling over and thinking about these books and their ideas, and I know the seeds are planted. When we called the year complete, we had about 5 weeks left on the AO reading schedule. A few things, I'm not concerned with, and a few things can be worked out this summer, I think. So now it's time to share our thoughts on Y4 and the books, and what our plans are going forward with books that continue into next year. We did not do the AO Bible readings, mostly because we do AWANA during school hours--that includes Bible readings, study and memorization. We didn't do Trial and Triumph, because with the age ranges of my kids and the long use of this book across the curriculum, there will be a few years I'll have three children in this book at one time. I'm thinking it will be easier to just put it on the family rotation soon. This Country of Ours - He read this book along with the librivox audio. The chapters were usually short, but it was his last choice every week. We are going to miss out on a few chapters, but I skimmed them and don't feel it will affect next year's history. He certainly won't mind. We will continue to use this book next year, but I'm considering how to approach it differently so he doesn't lose enthusiasm when it comes back out. George Washington's World - I though this book was interesting, but a bit disjointed. He still narrated it well most of the time. We did like that the weekly readings could easily be broken down into five short passages. We do four day weeks, so we always combined two shorter ones. I'm going to skim the last few weeks of reading material from this book to decide what he should 'free read' or we should discuss before starting back next year. Poor Richard - We didn't use this book. Ben Franklin of Old Philadelphia - I already owned it, it's a living book, and it fit neatly into the AO schedule. Being new to AO and a heavy reading schedule, I think having this book was a good choice for him. He gave good narrations for the most part, and we used this book for a couple of written narrations as well. Abigail Adams: Witness to a Revolution - He read a couple chapters independently, then asked me to read it to him. He gave decent narrations, but this is one of the books he didn't particularly love, and we got far enough that I will not require him to finish it. I think I am going to finish it myself though! Timeline/Book of Centuries - Neither boy did timelines, and I didn't have Elliott start a BOC yet. Because of the level of thoughtfulness and neatness required for a BOC, I'm thinking I will have him start in Y6 when the history rotation starts over. I decided early on to combine the boys for Geography since I already had the maps. It made more sense to do Y2 (two Holling books instead of just one, plus I wouldn't have to figure out Y4 geography for Emory down the road) so Elliott did those books. We used the maps from Beautiful Feet Books, though we didn't exactly follow the guide - mostly just the mapping and a few drawings. Tree in the Trail - He liked this book, and gave quality narrations. He even said geography was one of his favorite subjects at one point. Seabird - He liked this book too. He's not much for coloring, obviously, and neatness isn't a forte, especially with these larger maps, but understanding and appreciation for the topics being learned are my goals. Map Drills - We use the seterra website that is recommended on AO. He enjoys this, and works at beating his previous scores. Madam How and Lady Why - We used this book as scheduled for 15 weeks, before he suddenly asked to replace it. His reasonings didn't have to do with "boring" or "hard" and it wasn't about just giving up on the book or topic (unlike history) so I honored his request. Rocks, Rivers and the Changing Earth: A First Book about Geology - This is the book we used instead. I found the title on the AO forum. I know it can't replace everything unique about MHLW, but he found this book very engaging, gave excellent narrations, and enjoyed the activities. Since we started it later in the year, it was easy to spread it out enough to carry two years like MHLW, but I may have him work on this as a free read over the summer, to lighten his Y5 load a little, since we would like to maintain 4 day weeks. The Storybook of Science - He read this with audio, and narrated well. We found it a solid mix of familiar information and "new but random" factoids. We didn't finish the last few weeks, but this is one of those books that can be left unfinished without consequence, or he can finish over the summer if he chooses. Gregor Mendel: The Friar Who Grew Peas - This book is scheduled in one week, because it's a picture book biography. He read it alone and narrated well. It's a good book for a written narration too. The Ocean of Truth - We didn't use this. Isaac Newton: The Scientist Who Changed Everything - Already owned; It doesn't appear to be of the same caliber as Ocean of Truth, but being an easier read was a good thing for this year with a non-bookish kid. I'll definitely keep Ocean of Truth on my radar for the next round. We didn't follow the AO poetry rotation, because we were already doing poetry together when we started. Shel Silverstein: The boys loved him! Plutarch - Not this year. Shakespeare - We didn't start full plays, since the pre-7 list suggests doing retellings with students unfamiliar with Shakespeare. We did a few stories with Emory. "A Midsummer Night's Dream" (Lamb's version) and Bruce Coville's retellings of "The Tempest" and "Romeo and Juliet." He didn't care for Shakespeare, but I am hoping his brother's enthusiasm will rub off! The Age of Fable - The introduction to this was long and tedious, but once we got into the stories, he did fine, especially since this was his first formal exposure to myths. He was quite curious as to why they would create these false gods but not create them perfectly. Interesting discussions followed. Some of the stories captured his mind much more than others, but I think that's to be expected. I really like that they are short, so my goal is to transition him to reading with the audio in Y5, then independently by Y6. Robinson Crusoe - I read it to him, because it was challenging. The readings were long, so we had to spread the weekly readings out over several days. He did okay with his narrations, but didn't seem captivated by the story for the most part. Kidnapped - I tried to get him to read this along with the audio, but he just couldn't gain momentum. I struggled to read it out loud, so we rearranged the literature schedule. I decided to have him do Robin Hood with Emory this year, though that's going to be a summer read at this point. He can do Kidnapped later as a free read. Rip Van Winkle - I read this story to him, because our book is older with tiny font, and I wanted to make sure he was following appropriately. He understood and followed it well, and gave decent narrations. Paul Revere's Ride - We've read the suggested picture book multiple times, so I didn't worry about getting it in; plus Longfellow is a poet for both Y3/Y5 next year, so we'll get to again. The Legend of Sleepy Hollow - We didn't get to this last story, but he's familiar with the storyline. We can get to it as a free read, or when Emory gets to Y4. Penmanship/Copywork - He did some review of cursive, and did plenty of copywork. Handwriting is not a hill I'm willing to die on, though I always encourage improvement and neatness. Dictation - We used Spelling Wisdom this year. It's easy to implement, and we will keep using it for now. Grammar - He did a bit at the beginning of the year, but I just chose to pick some out from his dictation and written narrations occasionally. We'll hit it full throttle in middle school. Typing - We used the free www.typing.com for practice, and it works well. Written Narrations - This was our first year doing written narrations CM style. I could see a steady progression in his narrations as the months went on, even though we didn't always do them weekly. I think next year we should hopefully see more improvement as we focus on grammar and he's had more experience with narrations in general. He used CTC Math, and it was the first year he didn't complain all the way through every math lesson! He is fairly good at math, but has always claimed to hate it. He now chooses to do math FIRST every day! We're sticking with it! Our attempt at Spanish was not worth mentioning, and we didn't start Latin at all. He did really well with our first year of picture study. He chose Ruben's Daniel and the Lion's Den as his favorite. I think he liked the intensity of Rubens overall, compared to the tranquil nature of Monet, or the formality of da Vinci. We didn't follow the AO hymn rotation for long, but we did essentially follow the Folk Songs for the 2017-2018 year. He said his favorite hymn was "I'll Fly Away" and his favorite Folk Song was "Camptown Races." I wasn't as intentional about art or handicrafts this year as I should have been. I was just happy they were taking art at co-op. We did do a handful of drawing lessons with See the Light, a few random handicraft activities (origami, clay) and we finished up our ArtAchieve lessons! I think next year we'll just focus on drawing and see where that leads us. He is a reluctant reader, so although we use the AO free read lists as a starting point, I gave him a lot of flexibility in choosing independent/quiet time reads. I also let him alternate some easier (high quality picture books) between the chapter books. He took on a heavier daily reading load for the first time this year with our switch, so I wasn't as strict about daily reading for him. I think next year, we'll be in a better rhythm with AO, but I'll also plan on doing some free reads in the summer. We read more as a family, but I'll share those in another post soon. If you look at this one way, we "didn't do" a lot of things. We did, however, exercise perseverance by pushing through things we found difficult. He was engaged in science, and we read a lot of thought-provoking literature. I was reminded of how much he likes geography. Looking at this list, just like Y2, it can fee like a long overwhelming list of books and subjects - but it's so much more. It represents all the ideas that were planted, all the exposure to the arts, the great discussions we had, and the connections being made. I am really glad we made the switch back to AO. While I don't regret the years or books with other curriculum, there is a part of my homeschool heart that does still mourn the "lost years" where we strayed from the purest and simplest elements of Charlotte Mason. Ahh well, it is what it is. We're here, and I really want to stick it out this time and reap the benefits! We have officially ended our 2017-2018 school year. I declared the kids on summer break and sent their portfolios to the reviewer. We didn't quite finish our AO readings before I made the call, but since they were doing other curriculum before the switch to AO, they definitely got in a full year. I wanted to make the transition to summer break before any tired or frustration set in, because that's not the attitude I want any of the kids to have about "school" or their education. I did ask the kids to share their favorites with me and take a picture with all their AO books I could quickly round up--poetry, some free reads and audio books, and a couple of books the puppy destroyed are missing. I wanted them to see the feast, see all of their hard work, so to speak! I noticed after the fact, someone has been messing with my canvas map and those wrinkles need some attention. 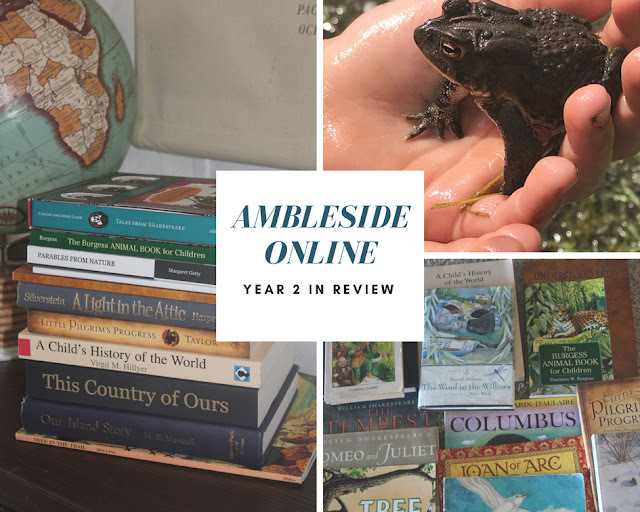 *ahem* Now I thought I'd share how Emory's Ambleside Online Year 2 went overall, and how we're going to wrap up the year informally this summer and early next year. We did not do the Bible Readings, as we do our AWANA books during school time. We also did not read Trial and Triumph; I am going to put that into family rotation at some point. Our Island Story - We read this book together most weeks, though occasionally he would read it independently. We both really liked this one! We read all but the last two scheduled readings, and after skimming, I think I'll just make sure to read the part about transitioning from the Plantagenets to Tudors when we start back up next year. A Child's History of the World - We liked this book as well. It's an easier read, and he read this independently more frequently. We got in all the scheduled readings, so we'll pick up on schedule with this for Y3. This Country of Ours - We read the chapter on the Vikings in term one since we'd read Leif the Lucky last year, but if I'd remembered that Part II of Viking Tales was an option, I might have used it. I don't think it matters much, though. When I knew we were going to cut out the weeks with the Columbus chapters at the end of Term 3, I pulled out the alternative Christopher Columbus book thinking he could use it as a free read, but he remembered nearly all of it from last year, and could narrate it fairly well, so I let it go. The last scheduled chapter about how America was named was skipped, but we can read that as a free read at the beginning of next year. The Little Duke - We enjoyed this book! I felt like the pacing could have been picked up a little, especially at the end with shorter chapters. Emory really appreciated the friendship between the Duke and Prince Carloman, so the ending touched him, though not enough to cry like his momma. Joan of Arc - He was fascinated with this story! Although he knew the outcome, as the history readings covered it before we finished the book, he was intrigued and really enjoyed it. Timeline/Mapping - We did not do a timeline this year, but I did keep a timeline of Kings in his binder. (They're timeline cards, but we didn't cut them out.) I did try to do look at maps when we remembered or needed clarification. Before switching to Ambleside Online, I had purchased the Geography maps and guide from Beautiful Feet Books. Since I already had the large maps, and one of the Y2 books, I put both boys together for Geography. Although we didn't do all of the extra stuff in the guide, I loosely followed the reading schedule. Tree in the Trail - He did not love this book. I don't know if it was the book itself, or the map, or if it was because the BFB reading schedule was too fast. He's not a fan of coloring, either, as you can see. Seabird - He liked this book more. We still read faster than the AO schedule, but we slowed it way down overall. This map was a little better at first, though I think more boarder lines would have made it easier for him. The Burgess Animal Book - For part of the year, he claimed this was his favorite book. He loves animals, so I knew he would enjoy the year's science. He did some drawings, but he really liked having the coloring pages and looking the animals up on video or in the field guide. We only have a few chapters left, so he's finishing those up on his own as a free read. Nature Study - We didn't intentionally follow the AO nature study schedule, but ended up studying the three scheduled topics anyway. Of course there has been a lot of informal and impromptu nature study on many topics, as this is one of his favorite subjects and activities. 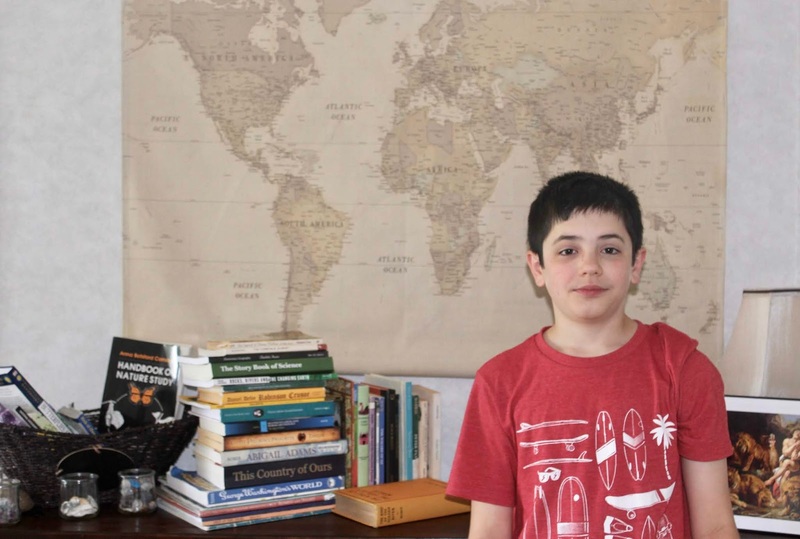 He wants to be a zoologist, and he wants to live in Brazil and explore the rainforests. He will pick up and examine any critter he can find! We did copywork of verses, quotes and literature passages, while he also learned cursive. Then we got Language Lessons to review. It is a complete language arts program for 2nd/3rd grade, and is appropriate beyond that as well. It uses living books, narration, copywork, recitation, dictation, and light phonics/spelling review. It also includes picture study and nature study. We received it late in the year, so he only did Book 1, which uses Aesop's Fables. He really enjoyed it, and I liked not having to come up with copywork passages. He is looking forward to finishing Books 2 and 3 next year. Although grammar wasn't really required, we did do a small unit with our Hake/Saxon Grammar and Writing 3 review. We'll transfer the remainder of the curriculum to next year (4th grade) when most CM programs suggest starting grammar. Emory has worked through CTCMath 3rd Grade, and he's done really well with it. He transitioned to it a little later than Elliott, so he still has a handful of lessons left, but we'll work a couple days each week after we recover from VBS to finish off and keep skills fresh over the summer. We've also used Xtra Math to drill math facts. Spanish was sporadic and hardly worth mentioning. Maybe next year. We didn't follow the AO rotation, as we'd already started poetry as a family when we switched over. Shel Silverstein: Funny, the kids loved! Shakespeare - We didn't follow the AO schedule, but we did get in a few stories. "A Midsummer Night's Dream," (Lamb) and two retellings by Bruce Coville: "The Tempest" and "Romeo and Juliet." Emory loved these stories and did excellent narrations! Parables from Nature - We did okay with these first term, but second term was a struggle and we set them aside for the year. I'm debating on doing them as scheduled next year, or turning this into a family read. Pilgrim's Progress Book 1: Christians' Journey - We actually used Little Pilgrim's Progress, and I did this as a lunchtime read, since Elliott has never read it, and Eleanor could get familiar with it. We have a few chapters to finish up, but everyone likes it! Understood Betsy - Emory was kind of ambivalent about this book, but I adored it! I can't wait to read it again with the girls! Robin Hood - This one could have been a contender for favorite, I imagine, but we changed Elliott's reading schedule, thinking he would join Emory for this book. Trying to get them back together for just one more reading at the end of the day was like herding cats, so this book didn't happen. The AO schedule says to finish it over the summer anyway, so . . . After we get through VBS, we'll start fresh, maybe making this our lunchtime read. We received the Monet picture study portfolio to review, and it was our first real picture study. They loved it! 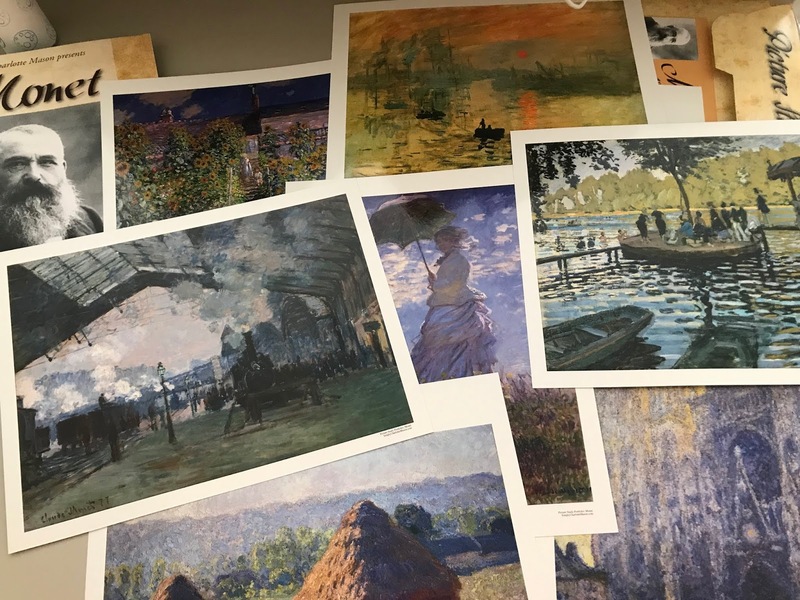 He chose a Monet as his favorite, though I genuinely expected him to choose a da Vinci or Rubens. I love when they surprise me! We didn't follow the AO hymn rotation for long, but we did essentially follow the Folk Songs for the 2017-2018 year. He said his favorite hymn was "Nothing But the Blood of Jesus" and his favorite Folk Song was "Camptown Races." This year we did one per month as suggested, and we focused on listening and appreciating, since it was new. Next year I think we'll focus on them a little longer, so we can truly learn all of them together. I wasn't as intentional about art or handicrafts this year as I should have been. I was just happy they were taking art at co-op. We did do a handful of drawing lessons with See the Light, a few random handicraft activities (origami, clay) and we finished up our ArtAchieve lessons! Ambleside has a great free read list for each year, and I use it for reference, but I'm more flexible with this category. We no longer call them "free reads" either, because that gives the impression that they have free reign over what they read. The truth is, when we have quiet/independent reading, the book has to be chosen with me. They have true free reads on their now time. So here are a few of those independent reads. I'll share more about family reads/audio books in another post. His "extras" this year included a variety of field trips, church activities (Junior Church, Junior Choir, Sunday School, AWANA, etc.) , and co-op. His classes at co-op this year were Art, Literature and Science, and he elected to take a basketball class before co-op as well. I have been very happy with our transition to Ambleside. Emory has thrived with the history and science, and did well with most of the literature. He went back and forth on his favorite books most of the year. He's not keen on geography yet, but I think next year's selection will fit him really well. His reading ability skyrocketed this year, and he did well in 3rd grade math. When I went back and looked over this post, it looks like such a long list of stuff, but when you think about all the wonderful stories, the beautiful pictures, the music . . . it truly is opening their eyes to the world around them and giving them a beautiful feast. I was very happy with placing him in Y2 and I can't wait to see what Y3 holds for us!